These are the top 10 betrayals of civil liberties in 2015. These 10 problems make us less safe and less free. Photo illustration by Lisa Larson-Walker. Photos by Getty Images, Reuters. Perhaps it’s almost understood in America that police brutality, the incarceration crisis, vote suppression, and other civil liberties sins are simply business as usual. Maybe that’s why it’s sometimes difficult to muster any real outrage as a year rolls to a close and we still face absurd breaches of our most basic freedoms. Still, what’s been bad in the past is still rather terrible in 2015, and we’ve invented some great new ways to ensure that U.S. citizens are neither very safe nor free. These problems go beyond idle election-year chatter about closing our borders to certain religious groups or creating national databases of Muslim Americans. We’re talking about actual betrayals of our liberties that happen every day, often without notice. Happy New Year! On the last day of its otherwise fairly liberal term, the Supreme Court approved Oklahoma’s plan to kill Richard Glossip and three other inmates with a drug cocktail including midazolam, which is supposed to render the prisoner unconscious. It doesn’t—at least not always. At least two death row inmates have been subjected to botched executions; Clayton Lockett was essentially tortured to death with midazolam. Given that the Constitution explicitly bars “cruel and unusual punishments,” you might expect the court to put midazolam executions on hold. But no: In a 5-to-4 split (with the usual suspects on each side), the court sanctioned the use of the drug in lethal injection protocols. In a remarkably callous opinion, Justice Samuel Alito wrote that midazolam was probably an effective sedative, since Oklahoma found an expert to testify that it was. (This expert’s primary source of information? Drugs.com.) But even if it wasn’t, Alito didn’t care: The prisoners had failed to identify a more humane and readily accessible means of execution, so they were stuck with chemical torture. In her scorching dissent, Justice Sonia Sotomayor pointed out the cruelty of this analysis: “Under the Court’s new rule,” she wrote, “it would not matter whether the State intended to use midazolam, or instead to have petitioners drawn and quartered, slowly tortured to death, or actually burned at the stake: because petitioners failed to prove the availability of [other drugs], the State could execute them using whatever means it designated.” (She might also have noted that the named plaintiff in the case, Richard Glossip, is almost certainly innocent.) But it was Justice Stephen Breyer’s brave dissent, joined by Justice Ruth Bader Ginsburg, that gave hope to civil libertarians by laying out a comprehensive case for why the death penalty is, “in and of itself,” unconstitutionally cruel and unusual. Breyer has stronger legal logic and moral force—but Alito has five votes. So, for now, the machinery of death grinds on, now with a cache of secret and illegal drugs that come from secret sources, and the increasing threat that those secret protocols will be hidden from the prying eyes of the press or the public. Kim Davis, the Rowan County Clerk of Courts, listens to Robbie Blankenship and Jesse Cruz as they speak with her at the County Clerks Office on Sept. 2, 2015 in Morehead, Kentucky. David Moore and David Ermold just wanted a marriage license when they entered Kentucky’s Rowan County courthouse in July, shortly after the Supreme Court brought marriage equality to every state with Obergefell v. Hodges. Instead, they were sucked into a vortex of national controversy when a county clerk by the name of Kim Davis refused to issue them a license simply because they were gay. The couple captured the indignity on camera and put it on the Internet, sparking a firestorm over gay rights, religious liberty, and free speech. 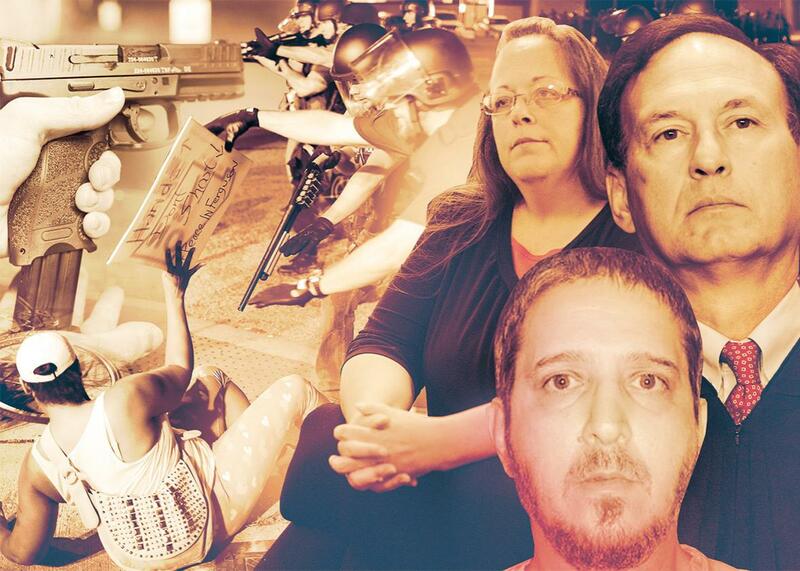 There were no real winners in the Kim Davis debacle—just victims. Moore and Ermold nearly burst into tears when they described their ordeal to me in August. Several other couples faced humiliation and legal uncertainty thanks to Davis’ stunt. And even Davis herself is something of a victim: As her legal battle dragged on, leading to a brief stint in jail, it became clear that Davis was being taken for a ride by her attorneys, a far-right fringe group called the Liberty Counsel. Mathew D. Staver, Liberty Counsel’s founder and chairman, used Davis’ case to raise money and boost publicity for his organization, pushing his client to become a martyr in clear contravention of her best legal interests. Americans have largely moved past the grotesque spectacle—but the couples whom Davis mistreated still aren’t certain whether their altered licenses are valid. 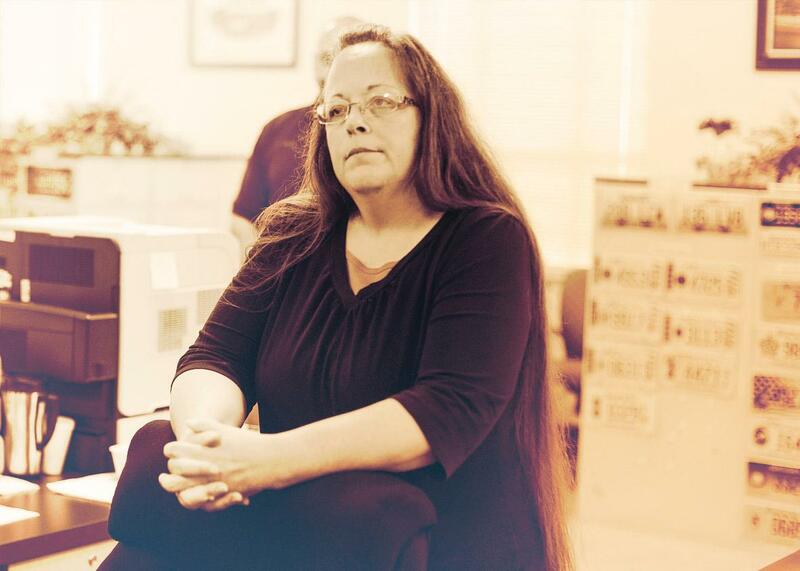 What good is equal protection of the laws if a county clerk can simply revoke a fundamental right she disagrees with? Gun violence is a horrifying plague in America, an epidemic that claims a head-spinning number of deaths every day. As federal courts have repeatedly confirmed, the government can (and should) closely regulate lethal firearms to keep them out of the hands of murderers and maniacs. But tethering gun control to secret terror watch lists, as President Barack Obama wishes to do and which Connecticut has already done, is not the best way to curb gun violence. The Supreme Court’s ahistorical, atextual reading of the Second and 14th Amendments as guarantors of an individual right to bear arms may be deeply flawed. But limiting any right, no matter how specious, based on undisclosed, mistake-ridden lists is even more unsound. The Constitution is anchored by the promise of due process; so long as gun ownership is considered an aspect of liberty, the government must not revoke it unilaterally, with no opportunity for appeal. Civil libertarians should push to abolish the terror watch lists, not expand their reach. 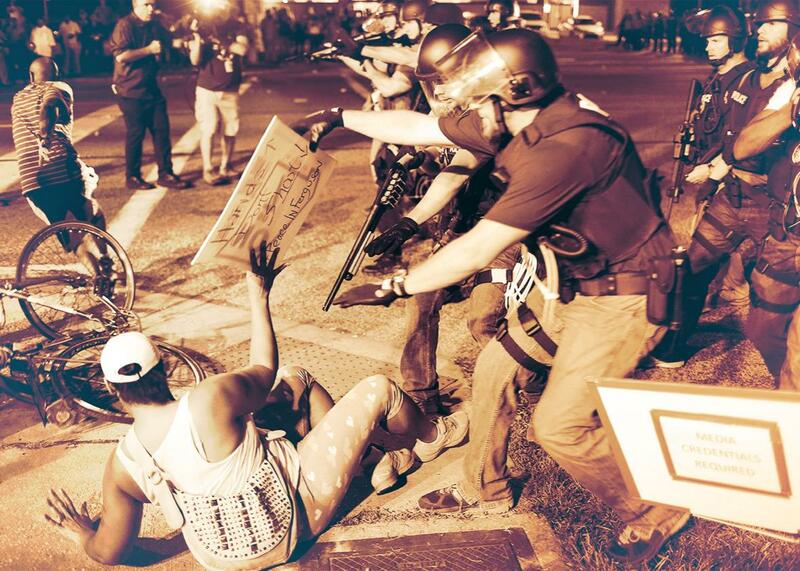 Police officers arrest a demonstrator on Aug. 18, 2014 in Ferguson, Missouri, amid protests of the Aug. 9, 2014 shooting death of unarmed teenager Michael Brown by a Ferguson police officer. Thanks in large part to the Black Lives Matter movement, 2015 was the first year that police brutality became a bona fide national concern. That’s the good news. The bad news is that police brutality and misconduct continue unabated: More than 1,110 people were killed by police in America this year, most of them minorities, making police shootings a bona fide public health crisis. Cops killed a black drummer chatting on the phone with roadside assistance; an unarmed black man in a wheelchair; an unarmed black 19-year-old—the list goes on, but the stories follow the same ghastly pattern. Of course, the killings only begin to tell the story: Don’t forget the black students brutalized in school or the endless stream of dashcam footage depicting excessive use of force. And police are virtually never held accountable for these horrific acts. Shortly before Christmas, a jury deadlocked in the trial of one of Freddie Gray’s alleged tormentors. On Monday, a grand jury failed to indict 12-year-old Tamir Rice’s killer. Old cases of police and prosecutorial misconduct occasionally bubble up to our consciousness: Corey Williams (an intellectually disabled minor framed for murder); Steven Avery (the subject of Netflix’s Making a Murderer, who was wrongly convicted then framed following his exoneration); Steven Crittenden (a black man sentenced to death by a carefully selected all-white jury); and Timothy Tyrone Foster (same). Time and time again, we see how police and prosecutors colluded to either set up plaintiffs or rig the system to ensure the maximum penalty. This mockery of due process has gone on pretty much forever. It’s heartening that Americans finally care—but distressing that it took until now for the country to wake up. Last year we listed the closing of abortion clinics around the country as a fundamental violation of civil liberties in America. That should remain on this list as we continue to learn of women who must drive hundreds of miles to procure safe and legal services, and as alarming numbers of women are losing access to any reproductive health services in their home states at all. But the situation has worsened in other ways in 2015. What happens when abortion is outlawed? Women who have abortions are prosecuted and imprisoned. This seemingly obvious fact has been cleverly obfuscated by the anti-abortion movement, which argues (absurdly) that it wishes to prosecute abortion providers, not the women themselves. But there’s a problem with this logic: When women can’t find an abortion provider, they become the provider. Who will the government prosecute when a woman performs her own abortion? The answer, of course, is the woman herself. In 2015, we witnessed perhaps the most galling abortion-related arrest yet, when Georgia law enforcement arrested Kenlissia Jones and charged her for malice murder after she took an abortion pill she bought online. (Jones was arrested in the hospital after the attempted abortion went wrong; police promptly locked her up in jail without bond.) If convicted, Jones faced death or life imprisonment. The charges were ultimately dropped, but Jones had already undergone serious trauma, plus the possibility of a death sentence. As red states continue to whittle away abortion rights, forcing more women to self-induce abortions, expect many more cases like Jones’. 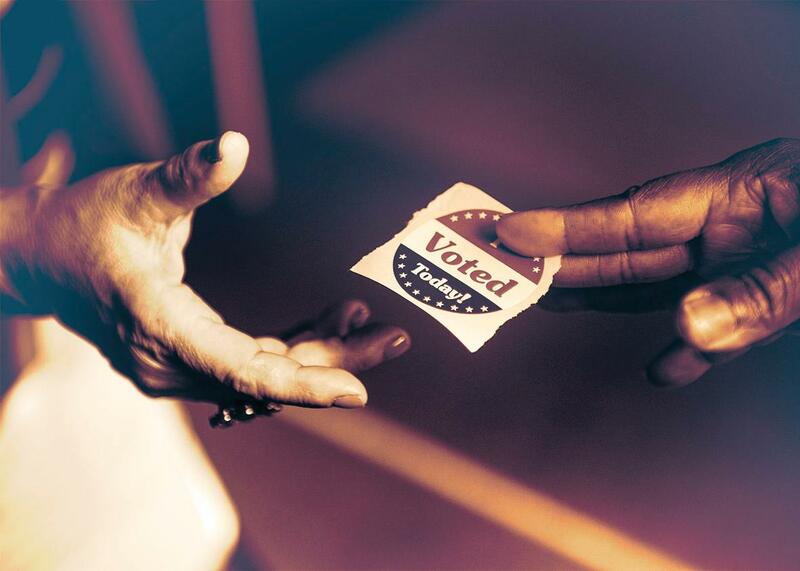 A poll worker hands out stickers during the first day of early voting Oct. 22, 2012, in Washington, D.C. Since 2010, some states have been falling over themselves to make it more difficult for citizens to vote. As the Brennan Center has carefully tracked, new voting restrictions are now in place in 21 states since that time, many having been passed in 2015. New voter ID laws, voter registration purges, felony disenfranchisement initiatives, and restrictions on student voting were proposed in the states. Although fewer such measures passed in 2015, limits on early voting, Sunday voting, and limits on voter registration have been passed in recent years. These have the intended effect of curbing minority voting, all in pursuit of a “vote fraud” epidemic that has never been proven to be real. Alabama Department of Motor Vehicles stations that serve rural and minority voters were closed, making the source for government-issued photo IDs, a prerequisite to voting in the state, disappear altogether in some areas. And in 15 states, these voting restrictions will go into effect for the first time in a presidential election in 2016. Much of the credit for making it more difficult to vote can go to the U.S. Supreme Court, which held in 2013 in the landmark Shelby County v. Holder that certain key provisions of the Voting Rights Act of 1965 violated the Constitution. Some states rushed to pass new voting restrictions on elderly, young, and minority voters (all of whom tend to skew Democrat) within hours and days of that decision. Many of those restrictions are now working their way through the courts. And at the Supreme Court, a challenge that would apportion state legislative districts based on the numbers of voters in a jurisdiction (as opposed to the population) met with surprising acceptance when it was argued in December. On the brighter side, more and more bills are being passed in an effort to expand voter access, including a much copied breakthrough Oregon law that would automatically register all eligible citizens who have driver’s licenses. Online registration measures have also been introduced, as have efforts to re-enfranchise some felons. Some of these measures have passed along bipartisan lines, signaling that modern technology and basic common sense may eventually spell an end to the very worst aspects of the voting wars. Perhaps one of the most shocking things to come out of our growing understanding of how police departments operate lies in the horrors of how civil asset forfeiture laws have been abused to make our poorest citizens poorer and our police departments solvent. In its simplest sense, civil forfeiture laws allow the cops to seize, and then keep or sell, any property they claim was used in a crime. There need never have been an arrest or conviction before the cash, cars, or homes allegedly used in criminal activity can be snatched and repurposed. Needless to say, this turns crime-fighting into what might be a lucrative proposition, without much recourse for the folks who lose their cars and homes, when the cost of fighting to get your stuff back often exceeds the value of the property in the first instance. The idea behind these laws was once to squeeze mafia and gang members, but a national outcry has surrounded revelations that police departments may be scrambling for a cut from all sorts of victims, including, this year, the life savings of a college kid whose assets were seized under the unfounded suspicion that he was involved in selling drugs. Racial profiling is, of course, playing a significant role in determining whose assets get seized in the first place. There has been some pushback recently, with some interest from the House Judiciary Committee and the announcement just last week that the Justice Department will temporarily halt its so-called “equitable sharing” program, which allowed “law enforcement agencies to partner with the DOJ to seize assets and distributes up to 80 percent of it back to the local police.” Annual revenues from that program, notes Reason magazine, “blasted off between 2000 and 2013, zooming from $198 million in annual revenue to $643 million.” Taking money and assets from people who lack the resources to fight back, and divvying it up between government agencies that should be protecting them rather than preying on them, was always a bad idea. It needs to be stopped altogether. It has long been known that there is a difference in how judges mete out sentences depending on how they are seated. Judges who are elected and must face opponents who accuse them of being “soft on crime” feel pressured to be far more punitive than those judges who are appointed and do not answer to an electorate. This year brought the news that whether a judge is appointed or elected influences whether a defendant receives the ultimate punishment. In short, along with the other flaws in our current death penalty system, the very mechanism we use to seat judges affects the likelihood that a prisoner will live or die. This makes a capital punishment system that is already arbitrary, racially tainted, and geographically loaded even more capricious and unjust. The prison-crowding crisis in this country is not new or even news. U.S. jails now hold nearly 700,000 inmates, up from 157,000 in 1970. We know that this country locks up black and Hispanic men in numbers that shock the conscience, and that many more Americans with severe mental illnesses are now incarcerated in prisons than treated in mental hospitals. A report by Maura Ewing in Pacific Standard revealed that a great many of the 700,000-plus people detained in 3,000 local jails are behind bars because they simply can’t afford to make their bail. One study found that 54 percent of the jail inmates in New York City were held until their trial because they couldn’t pay a bail of $2,500 or less. Meaningful efforts to curb the growth of the prison state occurred in 2015. The Justice Department is in the process of releasing up to 6,000 inmates serving draconian sentences for drug-related offenses. California is releasing drug offenders and nonviolent criminals to allay its prison-crowding crisis. Bipartisan legislation is being considered in many states to begin to allay the nation’s overincarceration crisis. But prisons continue to be a driving force in our economy. According to the Bureau of Labor Statistics, in 2014 prisons and jails in America employed 434,000 correctional officers and jailers. Their unions have clout. Americans were horrified to learn this year that the fancy goat cheeses they were buying at Whole Foods were being produced by Colorado inmates being paid as little as 74 cents a day for their labor. And the saga of prisoner treatment in solitary confinement received an unanticipated public spotlight this year when Justice Anthony Kennedy tacked a memo onto an opinion in an unrelated case this June, begging America to reconsider this cruel and brutal practice. New York, under fire for its brutalizing solitary confinement policies, announced major reforms in December. Guns and gun laws are one of the single most compelling—and divisive—civil liberties issues of our time. Over the past several decades, gun owners have transformed the Second Amendment from an obscure provision about the regulation of state militias into the pinnacle of American liberty—a right so sacred it can tolerate no encroachment, even to save lives. With help from people who imagine that the government wants to take away their weapons and lock them in underground bunkers stashed under Texas Walmarts, the National Rifle Association has attempted to paint gun ownership as America’s single most cherished and critical freedom. 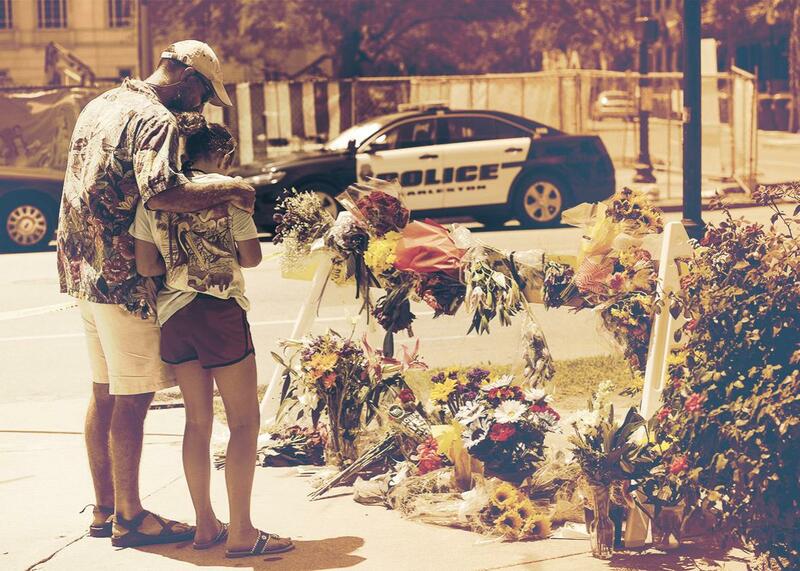 People visit a makeshift memorial near the Emanuel AME Church on June 18, 2015, in Charleston, South Carolina, after a mass shooting at the church the evening before. We would like to propose that there is a competing civil liberties interest at stake in America today: That we should be able to walk into malls, movie theaters, restaurants, and churches—to send our children to school—to attend universities—free from the threat of being shot by someone who believes that their civil liberties are the only ones that matter. There is not yet a right to be free from being terrorized by guns every day of our lives on the streets and stores and institutions of higher learning in America. We think there should be. Check out all Slate’s coverage of the best (and worst) of 2015.